^ a b Black, Rachel (2010). ^ a b Michael Foley, Drinking with the Saints: The Sinner's Guide to a Holy Happy Hour (2015, ISBN 1621573834): Perhaps the most interesting option is applejack, the first distilled liquor native to North America and a great favorite among the colonists. ^ a b Karen Tina Harrison, Jersey Lightning, New Jersey Monthly, July 13, 2009. 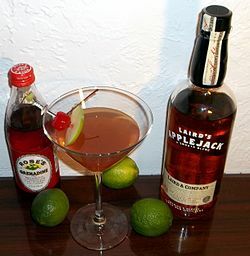 ^ Scott C. Martin, The SAGE Encyclopedia of Alcohol (2015, ISBN 1483331083): The evaporative technique was used when commercial applejack production began. ^ "2005-Laird apple products sell sheet" (PDF).